Looking for Cleaning and Sanitizing Canning Jars Prior to Filling Them in 2019? Scroll down this page and follow the links. And if you bring home some fruit or vegetables and want to can, freeze, make jam, salsa or pickles, see this page for simple, reliable, illustrated canning, freezing or preserving directions. There are plenty of other related resources, click on the resources dropdown above. It's pretty obvious that canning equipment, jars, lids, etc need to be clean to avoid spoilage and food poisoning. But how to clean and the definition of clean may need some clarification. Most people refer to making surfaces free of germs and safe as "sterilizing". In practice, true sterilization is impossible to acheive in a home, so food scientists refer to "sanitizing" equipment and jars. They recommend that all jars used for home food preservation, such as jams, jellies, and pickled products which processed less than 10 minutes in a canner should be filled into sanitized empty jars. If the jar will br processed for more than 10 minutes in a canner (water bath or pressure canner) then the canner does the job of killing germs and sanitizing the jar. But in practice, whether the recipe calls for 5 minutes, 10 minutes or 50 minutes of processing common sense tells us we ought to make sure the jars are as clean as we can practically make them. To sterilize empty jars, put them right side up on the rack in a boiling-water canner. 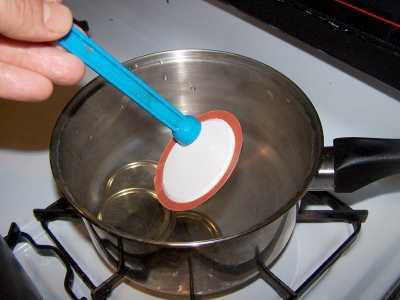 Fill the canner and jars with hot (not boiling) water to 1 inch above the tops of the jars. Boil 10 minutes at altitudes of less than 1,000 ft. At higher elevations, boil 1 additional minute for each additional 1,000 ft. elevation. Remove and drain hot sterilized jars one at a time. Save the hot water for processing filled jars. Fill jars with food, add lids, and tighten screw bands. 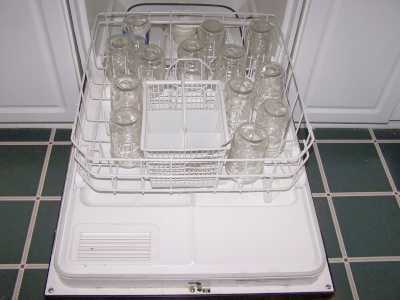 Many newer dishwashers now have a "sanitize" cycle which is design to accomplish the sanitizing above. I do this right before I use the jars, and keep them in the dishwasher stayiong hot until I use them. Canning lids have a glue around the edge that seals against the jar. For this reason, we don't boil the lids. Instead we put them in very hot water (180 - 200 F ) (or 85 - 95 C)for about 10 minutes. I just leave the lids in this hot water over very, very low heat until I am ready to use them. This not only sanitizes the lids, but also softens the sealing surface to make a better seal. You don't need to sanitize the rings since they do not come in contact with the food! Using the approach above, I rarely EVER have a jar sospoil! Adapted from the "Complete Guide to Home Canning," Agriculture Information Bulletin No. 539, NIFA-USDA (Revised 2015). Page reviewed February 2, 2017.